CalenGoo Desktop is the desktop version of a calendar app that is available for iOS, Android, Mac and Windows. This is a beta version of CalenGoo for Windows and MacOS. A beta version contains most features but there still may be some bugs. If you have any problems please use the Support page or contact desktop@calengoo.com so that I can help you. The beta version may be used for free but to continue to use it afterward you have to purchase a license. During the beta phase new versions might be released that extend the beta phase and allow you to continue to use it until the final version is finished. It is possible to sync with Google (Google Calendar, Google Tasks, Google Contacts, Google Drive, Google Mail), Microsoft Exchange (calendars, tasks, contacts, emails and attachments), CalDAV servers (calendars and tasks, e.g. Yahoo, Baikal, Gmx, Nextcloud and ownCloud) and Evernote. 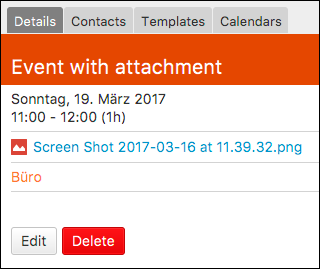 On MacOS it is additionally possible to sync with the computer’s MacOS calendars and MacOS reminders, this way it is also possible to sync e.g. with iCloud and further kinds of accounts on MacOS. The support for editing CardDAV and Exchange contacts has been added recently, please tell me if you have any problems. Syncing with Google, Exchange and CalDAV has been tested for several months and should work fine. CalenGoo has several calendar views: Day, week, month, agenda and year. In addition it has a task view that you can use if you sync tasks with Google Tasks, Exchange, CalDAV or macOS reminders. Further panes will be added in the future. You can drag events to change their time and date, even while editing the event. You can drag the lower edge of an event in the day/week view to change its duration while editing it. 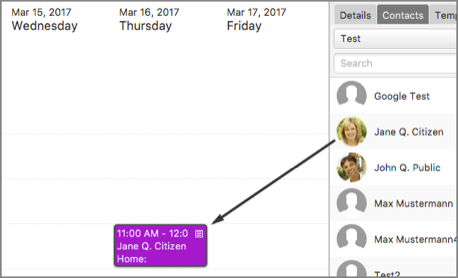 You can drag contacts onto the calendar to create a new event with that contact. You can drag contacts onto the edit view to add them as an attendee or a linked contact. You can drag tasks onto the calendar view to change their due date. You can drag events onto the templates pane to create a new template or you can drag events from the templates pane onto the calendar view to create a new event. You can drag files onto the event edit screen to attach them. You can drag emails from the email list onto the calendar to create a new event and attach the email. Using the search field you can quickly search for events in your calendar. Using the quick add function (CMD-N or CTRL-N) you can create an event by entering free text like "Meeting with John tomorrow at 5pm". 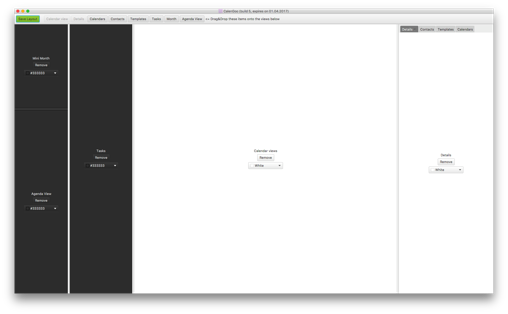 CalenGoo will parse the text and create an event from it. The event is opened in the edit view for review. To confirm the creation of the event just press CMD-RETURN or CTRL-RETURN. If you often have to enter the same or similar events, you can use CalenGoo’s templates pane. Just drag an event onto the pane to save it as a template. And drag it from the templates pane onto the calendar to create a new event from it. 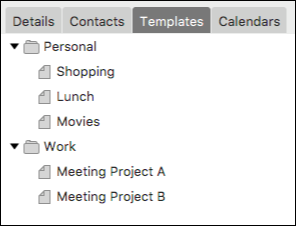 Templates can also be organized in folders. You can attach files to your events by dragging them from the Explorer or Finder onto the appropriate field in the event edit screen. And you can view attached files by clicking them in the detail view. Additionally you can attach contacts, emails and Evernote notes. 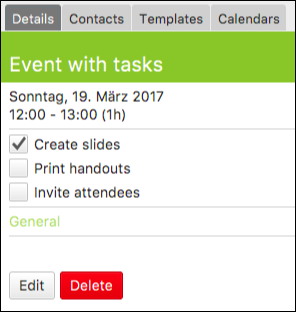 You can add a small list of tasks to events. Just use the "Add task" button in the edit screen or press return after entering a task to add another task. You can assign icons to your events which will also be displayed in Google Calendar. 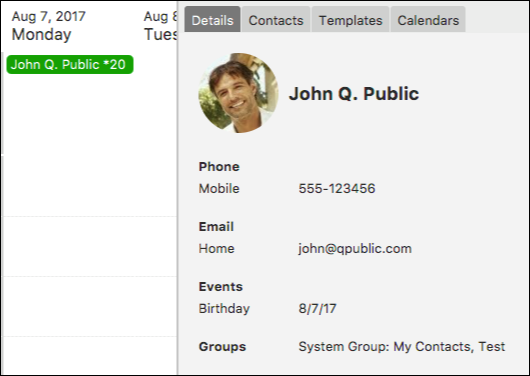 CalenGoo can sync with Google Contacts to display the birthdays of your contacts. When opening a birthday, the contact is displayed so that you can see e.g. the phone number of the person or click on the email address. 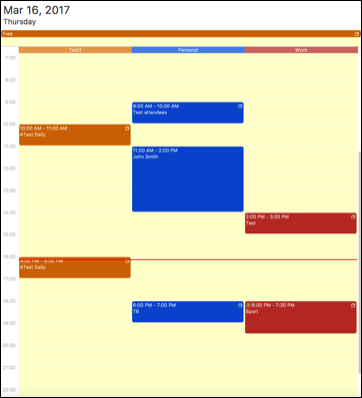 CalenGoo can use fixed columns for calendars in the day and the week view. This is useful if each calendar represents a person or a resource and you would like to easily see when this person or resource is available. 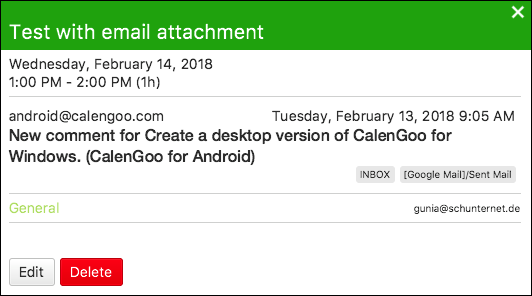 CalenGoo contains an email client that allows you to view and write emails. It supports Google Mail accounts (including labels), IMAP and Exchange accounts. Additionally you can attach emails to events this way. This allows you to open emails that are related to an event directly from the detail view of an event. From there you can answer or forward these emails. And if you have problems or questions please send an email to desktop@calengoo.com. The macOS version needs at least macOS 10.10. CalenGoo is provided "AS IS". No guarantees are made, you use it on your own risk. I try to make it as stable as I can and I will try to fix the bugs that I get reported. But I don’t guarantee anything.